I spent yesterday at p-camp, an unconference for agile product managers. The event was hosted at Yahoo! and put on by the folks at Enthiosys. I led two sessions: Agile 101, and Why do Agile Projects Succeed (or Fail)? This post is about the Agile 101 session. Watch for future posts about my other session, and some more pictures. The intention of this session was to provide an overview of what “agile” is, for those who are new to agile. Honestly, I wasn’t sure how many folks would turn out, given that this was a conference explicitly for agile product managers. Well, the room was full. Even better, the energy and curiosity levels were sky-high. This is where it got tough for me. 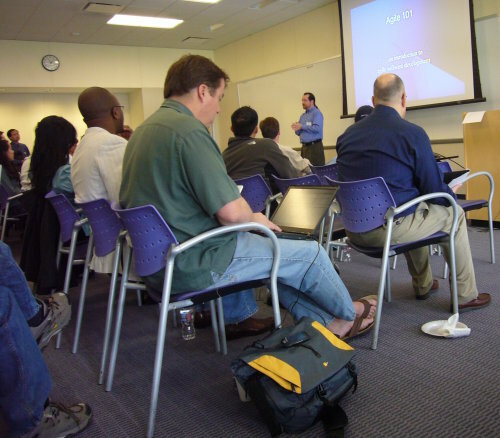 I prefer doing interactive sessions, as opposed to “stand and deliver” lectures. With only 45 minutes to work with, I only got through the first half of my slides. This is good for all of the people who got their questions answered; I’m happy that they got the information that they needed. Still, I felt like there was a lot of “the basics” that didn’t get covered. This was confirmed by number of folks who came up afterward and asked for the slides. I’ll do the long or short version of Agile 101 for your organization for free. The regular prices for these talks are $1000 and $500 respectively. Send an email to this address: FreeAgile101@AgileLearningLabs.com to claim your free session. My thanks to everyone who came out and made the sessions so much fun. This entry was posted in agile, classes, conferences, scrum, software, teams, xtreme programming. Bookmark the permalink. Trackbacks are closed, but you can post a comment.